The Squirrel is the 3rd issue out of 6 in the Encyclopedia Britannica Friends of the Forest Series by artist Kevin Daniel for Edwin M. Knowles, sponsored by Encyclopaedia Britannica. 1987. 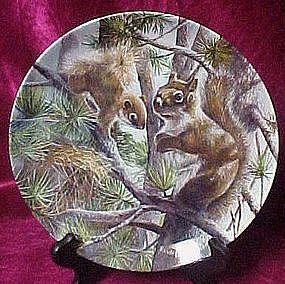 8 1/2" in diameter, plate depicts 2 red squirrels sitting among pine branches, a momma and baby. Mint condition w/certificate, & box. I will be listing others from this series.